Zagg normally produces some stellar products, but this sn't one of them. I’ve had a lot of luck with ZAGG’s smartphone and tablet accessories in the past. I’ve forked over close to $300 to outfit my iPad Mini 2 and iPad Air in their Rugged iPad Keyboard Cases. And for a long time, the company’s ZAGG Keys Universal Keyboard found its way into my backpack whenever I needed to type on the fly. As such, I was looking forward to taking the ZAGG Pocket Keyboard for a spin. Unfortunately, the user experience it offers is less than ideal, for a number of reasons. 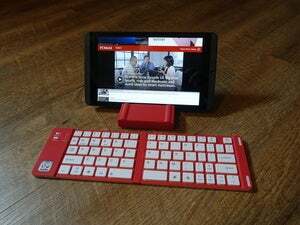 Similar to other portable bluetooth keyboards like the Jorno, the ZAGG Pocket folds up to make it easier to carry around. While closed, it measures 8.8 x 2.2 x 0.6 inches—about the same dimensions of one of those sharing-sized Walmart chocolate bars we’ve all shame-eaten in the past. When deployed, its dimensions change to 8.8 x 7 x 1.75 inches. 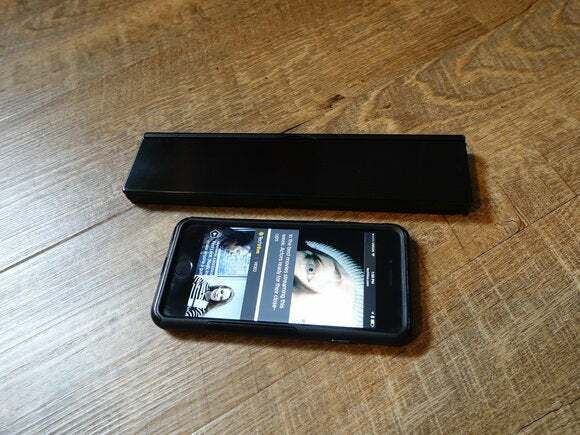 Much of the keyboard’s height when opened comes from its built-in stand, which is big enough to support most smartphones or tablets. 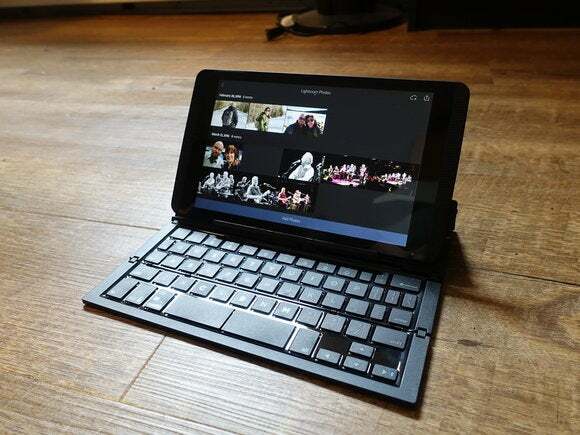 However, while it handles the weight of a 9.7-inch iPad Pro or Surface 3, I couldn’t help but feel that using tablets that much wider than the keyboard and its stand was precarious. While the built-in stand sounds like a great idea, it’s actually semi-irritating during use. You only get one viewing angle, making it problematic to see what you’re typing when using the keyboard in close proximity to your body—like on an airplane tray table, for example. Additionally, the ledge that folds out of the stand to keep your tablet or phone from falling over is only wide enough to accommodate devices without a protective case on them. Anyone who prefers the protection of a Griffin Survivor, Lifeproof, or Otterbox case for their device will likely find the ZAGG Pocket pretty useless. The ZAGG Pocket is constructed out of aluminum and some fairly decent-quality plastic. But it doesn’t feel nearly as sturdy as the Jorno or EC Tech keyboards do. I found that I was able to bend the ZAGG Pocket’s aluminum shell with a minimal amount of fingertip pressure. I could also flex the whole thing while it was folded up. That’s a level of fragility that doesn’t make me hopeful for the keyboard’s longevity. At the time that this roundup was written, the ZAGG Pocket could be had for anywhere between $50 and $70—and for that kind of money, I’d have likes to see a higher level of durability from it. 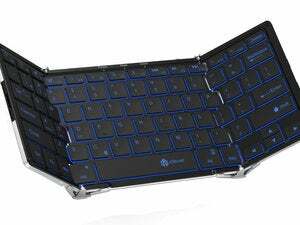 However, because ZAGG opted to use such lightweight materials in the keyboard’s construction, the Pocket does only weigh 6.8 ounces. Pairing the ZAGG Pocket is functionally much the same as it is for similar keyboards. Depress the function key, click the chicklet with the Bluetooth symbol on it, and you’re in business. As with the Jorno and its identical counterparts, you turn on the ZAGG Pocket by unfolding it. To turn it off, fold it back up. When closed, the keyboard is held together by a pair of magnets. 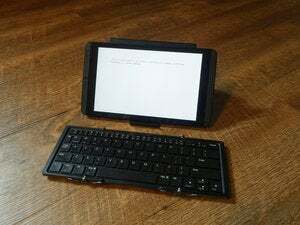 Typing on the ZAGG Pocket was more difficult than on the Jorno, largely due to the difference in size between the two devices. The Pocket is 1.61 inches narrower than the Jorno—as such, the keys on the Pocket are slightly smaller than most of those on the Jorno. There is one notable exception to this rule, however: The number keys on the ZAGG Pocket are the same size as its letter keys are. On the Jorno, the number keys are reduced in sized to make space for a number of tablet-specific function keys. No such function keys exist on the ZAGG Pocket. The Pocket’s key layout has other quirks, too: though the keyboard’s Delete key is a decent size, the Enter key is frustratingly small enough. I found myself missing it often enough to make me set the Pocket aside from time to time, in order to take a break from its aggravation. Worst of all, I found its key travel to be shallow and unsatisfying. That’s a deal breaker for a lot of serious typists. With its questionable durability, one-trick pony built-in stand, and disappointing typing experience, I’d recommend avoiding this particular keyboard. 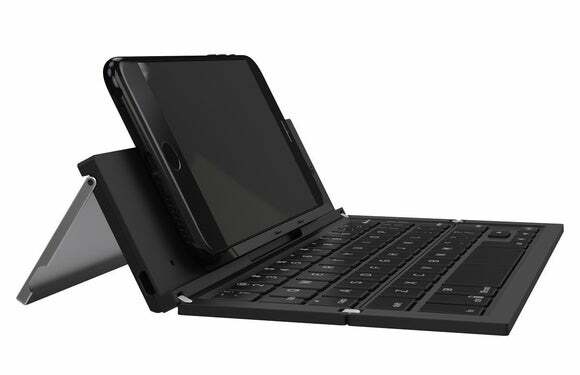 The Zagg Pocket keyboard isn't outright terrible, but with its questionable durability, one-trick pony built-in stand, and disappointing typing experience, there are better options to be had.